Tailored Living PremierFlex™ garage floor tiles are a fun yet practical way to improve the garage. With over a dozen color choices offered, you have the ability to personalize your space by using color combinations inspired by your favorite sports team, hobbies, or other design interests. Tile patterns could even be used to define parking spaces or other designated areas. 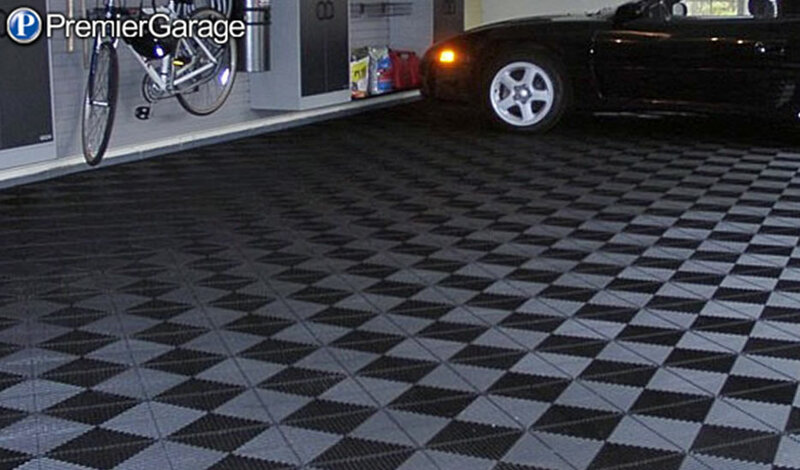 With a little creativity, your custom garage floor can transform the existing space into a new and exciting area. Choosing the right color combination can be a difficult process for some, so don't hesitate to contact your local Tailored Livingorganization specialist to help you find the right solution. Garages are inherently one of the hardest places in the house to keep clean because of rain water, tracked-in dirt, and car fluid leaks that add to the accumulation of sawdust and other debris floating around from garage projects. Our garage floor tiles have a unique design that allows easy cleaning and liquids to drain for safe walking or playing. The PremierFlex™ tiles' design offers a safety measure by allowing liquids to drain. This design also allows dirt to fall through for easy clean up keeping your garage looking spotless. Flex flooring tile is great for garages, workshops, exercise rooms, kid's rooms and playrooms, as well as patios or even around the swimming pool. With all the wear and teargarage flooring goes through; it only makes sense to use an option that can endure your day-to-day activities. By utilizing garage floor tiles, you will have a convenient alternative to the commonly used concrete floor. The tiles are durable and can handle heavy pressure, not to mention they're extremely easy to take care of. Be sure to contact your local Tailored Living organization specialist today for a free in-home consultation and ask how you can save during our Summer Saving Sale. During the consultation you will have the chance to explore options that best fit your home and garage space. Click here to view examples of our beautiful garage designs.